Motion books producer, Madefire, have entered into an agreement with IDW, the distributors of Star Trek comics, as well as several other publishers, to produce moving, subtly animated versions of their comic books. Motion comic books. I would compare it to the magical moving pictures in the world of Harry Potter except it’s far more subtle than that and despite my misgivings, I do see the potential value. I’m not a big believer in gimmicks for the sake of it but done right, motion comic books could be worth exploring. After watching the introductory video for IDW’s venture with Madefire and then reading this particular comic as a motion comic book – it felt a little too subtle. They could have pushed the envelope more in my opinion. In their defence, I can understand why they would play it conservative when introducing this new way of experiencing comic books. Star Trek fanboys/girls in particular are purists and don’t warm easily to change. Really ironic, I know. Having said that, you can almost feel the indecision and hesitancy in the motion effects and a few ‘whooshing’ sounds and a moving spacefield background may not be enough to convince comic book lovers to adopt this as the next big thing. My other small criticism is that as you move through the panels on the page, the text from previous panels disappears. Personally, I like to reread my panels as the plot unfolds and since none of the action overlapped, it seemed unnecessary to hide the text. ‘IDW Star Trek Episode #12’ (Please be aware that this series is numbered differently in the print edition) is based on the original TV episode, ‘Galileo Seven’ and continues with the story begun in previous issues. Mike Johnson and his team have done a good job of re-interpreting quite a few of the scripts from the original TV series. These storylines now feature the new motion picture cast on an alternative timeline. No spoilers – but if you’re a fan of the original TV series this retelling does diverge quite a bit from that. Spock finds himself in command of a stranded shuttle and its crew when a mission to bring supplies to the ailing population of Makus III goes horribly wrong. This issue deals with the events that occur as the shuttlecraft ‘Galileo’ is attempting to make a forced landing. Moving on to the cover art however, this issue was really disappointing. The Star Trek comic book franchise has regularly featured photo covers, a trend which I really dislike. Now, one of the few times they choose to go with an illustrated cover, it’s a failed attempt at an art-deco war-time poster. Brilliant idea, bad execution, my apologies Joe Corroney. Before you say Star Trek covers have never been anything to write home about, consider some of the crazy fantastic covers from the 1970’s and comic book cool covers like those from, John Byrne’s ‘Star Trek: Leonard McCoy, Frontier Doctor‘. My little rant complete, I must admit I have seen the photo-realistic alternative cover for the print-edition and in this case, though it pains me to say it, I would choose that one. 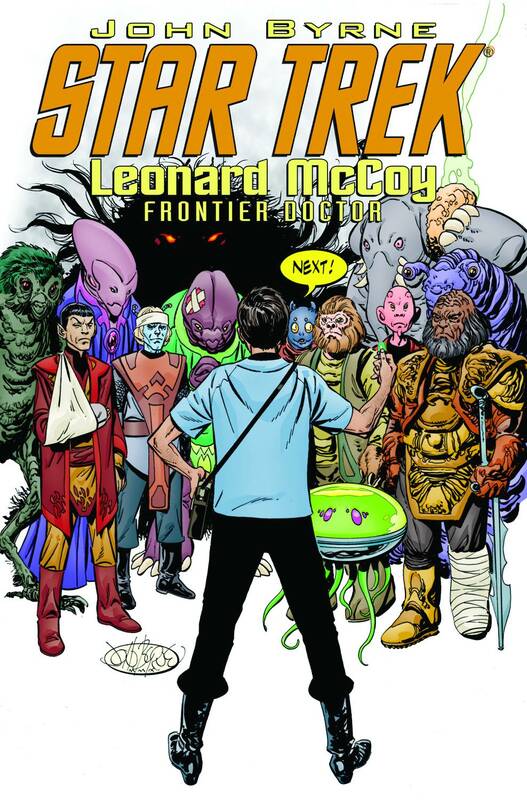 I applaud IDW for embracing alternative formats for the Star Trek franchise and comic books in general. There may very well be a future for motion comic books, I’m not sure they have the right formula just yet but only time will really tell.